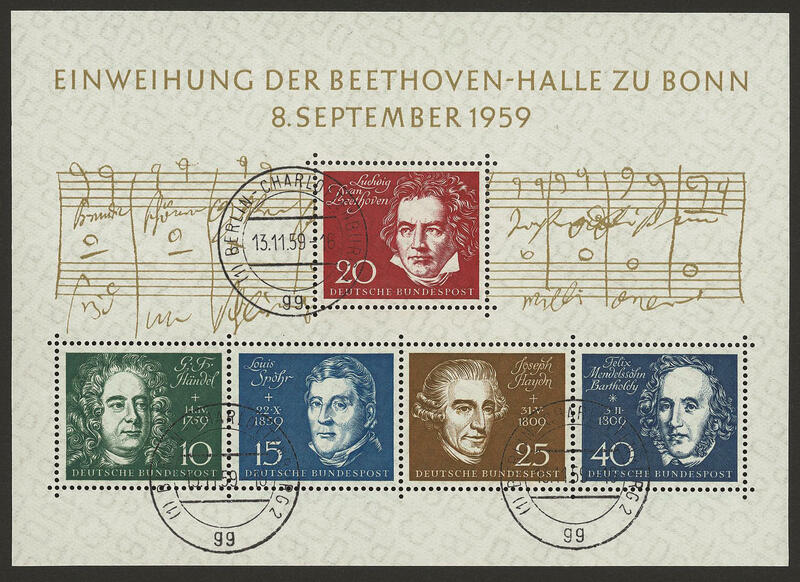 6990 ⊙ Bl.2 Beethoven-block 1959, in perfect condition, perfect used \"BERLIN-CHARLOTTENBURG 13.11.59. \". With this cancellation rare! 6991 320Uu 10 Pfg. 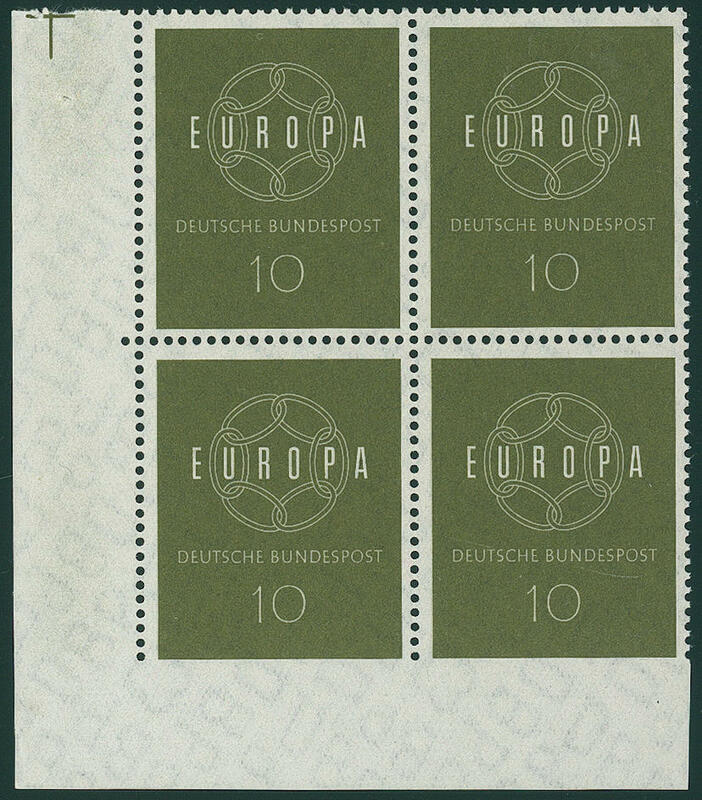 Europe 1959, corner margin block of four lower left, the lower pair at the bottom unperforated, unfolded and in perfect condition mint never hinged, without any signs. A wonderful unit this very rarely variety! 6992 344Pa 40 Pfg. 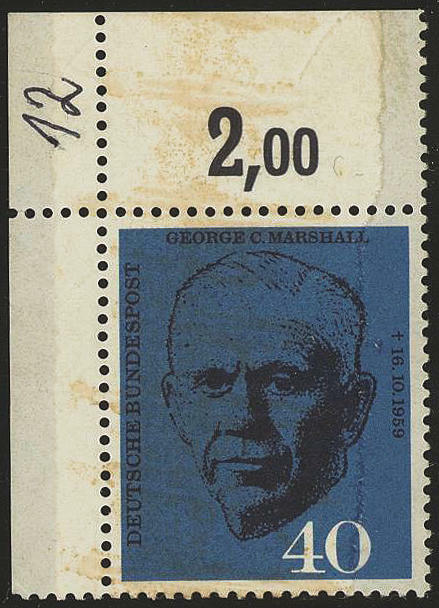 Marshall with spectacular variety \"glued paper web\" from the left upper corner, in perfect condition mint never hinged this is the by our knowledge up to now only known glued paper web of this issue thus one of the great rarities of the Federal Republic. By Michel up to now unknown and probable unique! Expertized Schlegel BPP. 6993 P2 25 Pfg. Blue, Albert Klunk, extremely rare essay proof the not issued stamp with hand stamp overprint \"cancelled\", fresh colors and in perfect condition mint never hinged one of the large Federal Republic rarities, from which very few examples have become known. Photo expertize Andrew Schlegel BPP. 6994 367yU 10 Pfg. 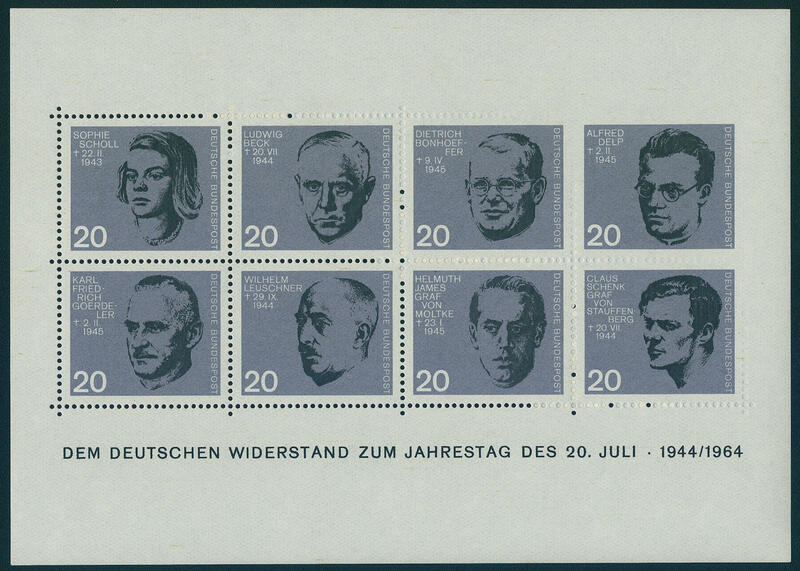 Europe 1961, four sides with wide margins unperforated, in perfect condition mint never hinged, scarce variety, photo expertize \"the quality is perfect\" Hans-Dieter Schlegel BPP. 6995 ✉ 367yU 10 Pfg. 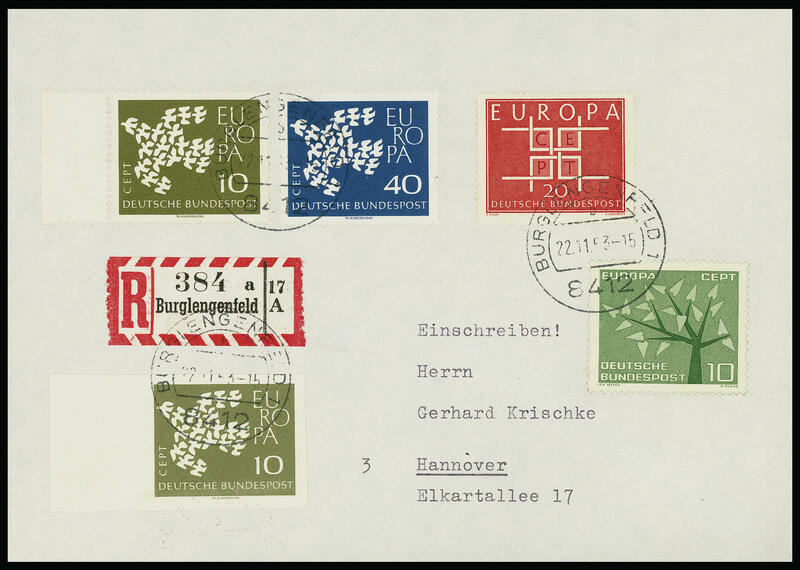 Europe 1961, four sides unperforated from left margin of sheet with additional franking on faultless, for the second weight step correctly franked registered cover from \"BURGLENGENFELD 22.11.63. \" to Hanover. On cover extremely rare and in the Michel special catalogue unlisted! Photo expertize Schlegel BPP. 6996 378Z 20 Pfg. 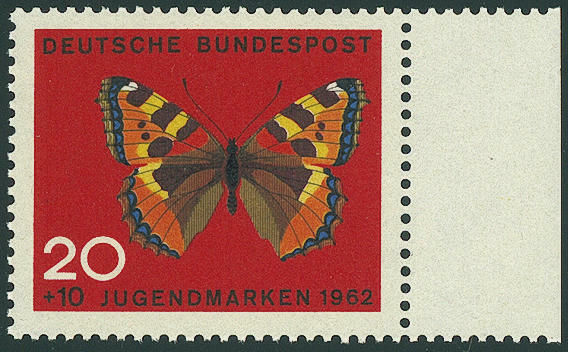 Butterfly 1962 with rare variety \"unwatermarked\", fresh colors and very well perforated from right margin of sheet, in perfect condition mint never hinged, twice signed Schlegel BPP. Michel 1000,- €. 6997 draft 383 10 Pfg. 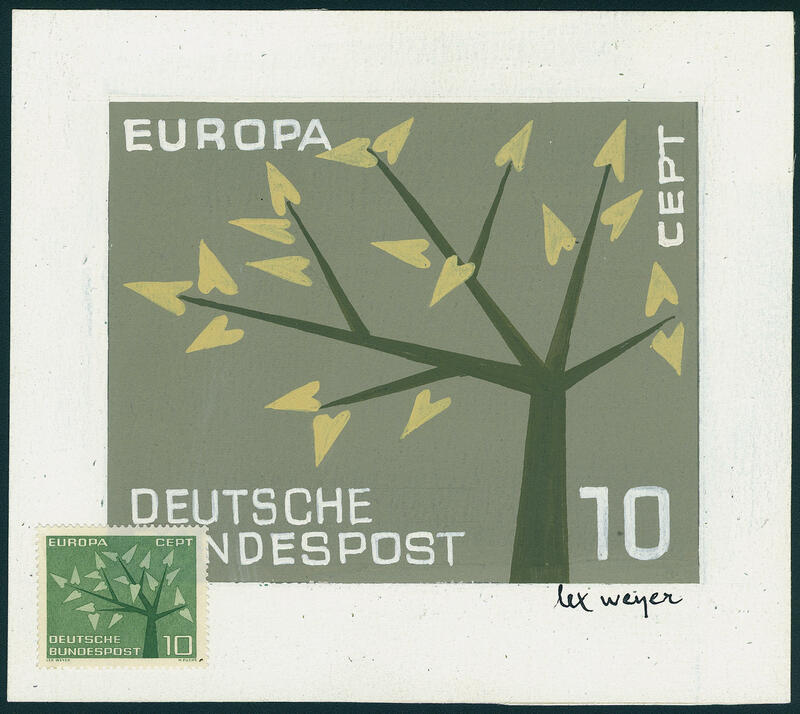 Europe 1962, hand painted original concept of the designer \"LEX WEYER\" with the later appeared original-stamp (left mounted) with signatur of the designer. A spectacular Federal Republic rarity! 6998 Bl.3Ut Resistance souvenir sheet 1964 with extremely rare party perforated, fresh colors and in original size, in perfect condition mint never hinged there are very few partially perforated souvenir sheets have become known, whereby it be here about the most beautiful us known copy act! By Michel catalogue clearly undervalued! Photo expertize \"the condition is perfect\" Andrew Schlegel BPP. 6999 440U/Ut 10 Pfg. 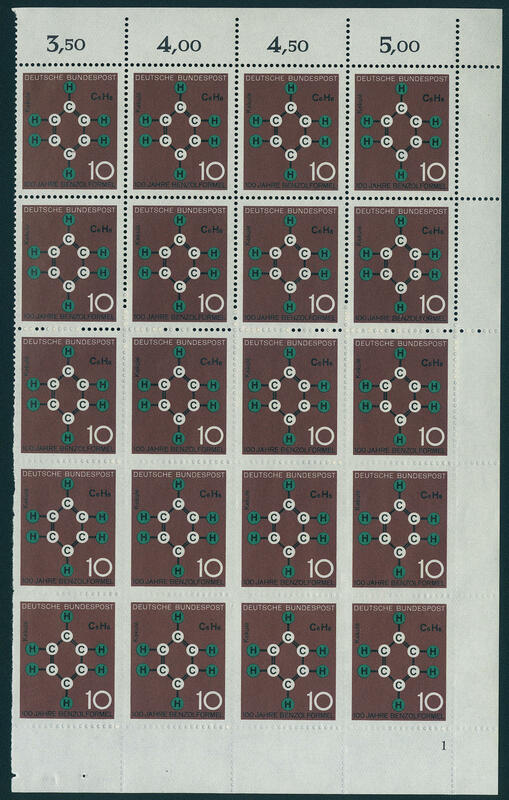 Technique and science 1964 in the part sheet of 20 each values with printing number 1, in perfect condition mint never hinged as well the lower eight values four sides unperforated and the middle four values partially perforated. It is to see, that the punch press the paper surface touched has, however the perforation no longer print through was. Especially in this unit an attractive and scarce variety! Michel 7400,- €. 7000 443Udr 20 Pfg. 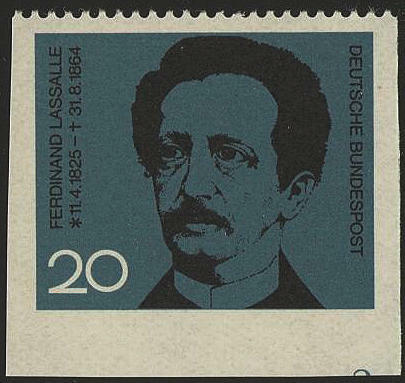 Ferdinand Lassalle 1964, three sided with wide margins unperforated from lower margin springing, in perfect condition mint never hinged a very scarce variety, by Michel clearly undervalued. Expertized Schlegel BPP. 7001 448Udr 15 Pfg. 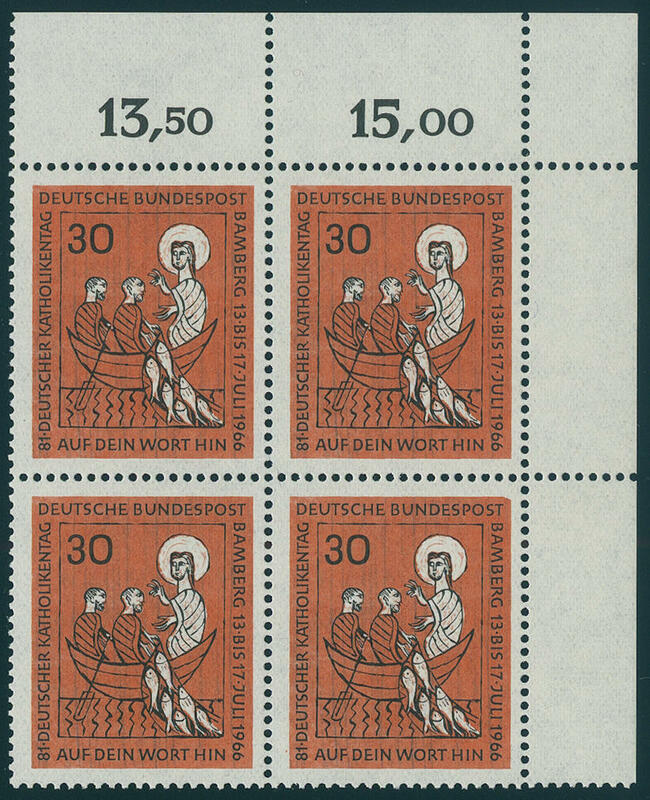 Fairy tale 1964, three sided unperforated from right margin of sheet in the horizontal pair with normal stamp se-tenant, in perfect condition mint never hinged an especially decorative and scarce variety, the only in few copies have become known is. Michel undervalued! 7002 ✉ 505Abart 20 Pfg. 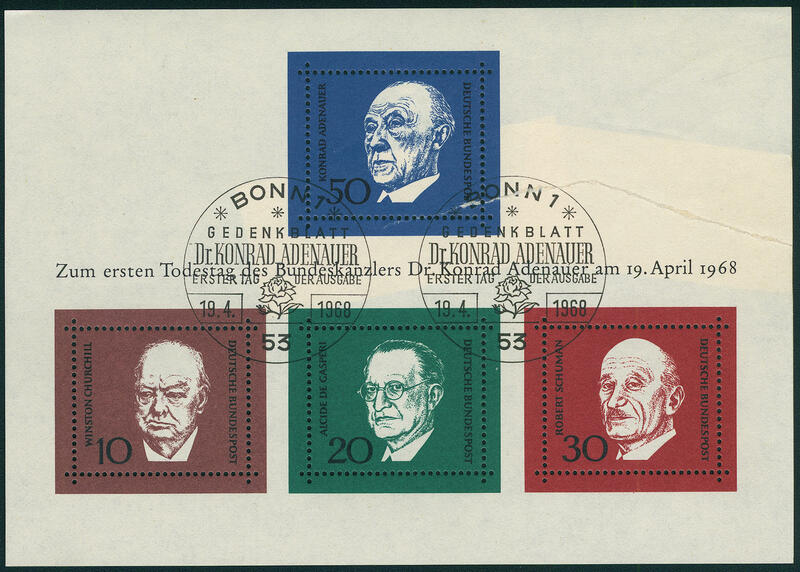 Cardinal from Formal events, horizontal strip of five from left margin, the left stamp with clear displaced Comb blow, through it above and at the bottom partially perforated, as well left with approximate 5 mm oversized. Correctly franked on registered cover with additional franking 10 Pfg. 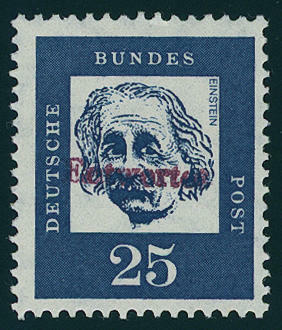 With special cancellation \"Lie 3.9.67\" and arrival postmark. In this kind probable unique! 7003 515I 30 Pfg. Catholic day 1966 with scarce plate flaw \"picture corner right above bevelled\" in the corner margin block of four with normal stamps se-tenant, in perfect condition mint never hinged photo expertize \"the condition is perfect\" Schlegel BPP. Michel 800,- €. 7004 515II 30 Pfg. 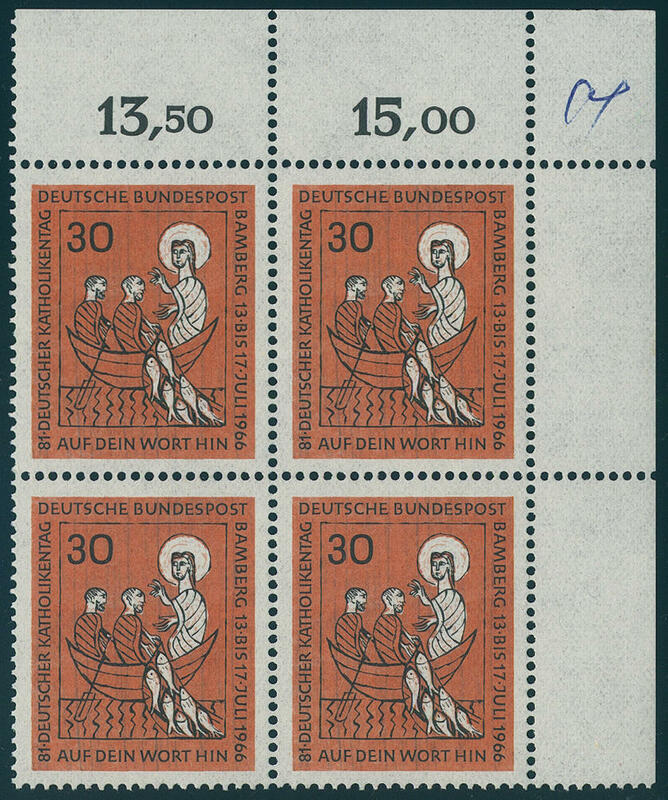 Catholic day 1966 with plate flaw \"added to picture corner (retouching) \" in the corner margin block of four top right with normal stamps se-tenant, in perfect condition mint never hinged Michel 550,- €. 7005 536Ut 30 Pfg. Evangelical church congress 1967, vertical pair from upper margin. 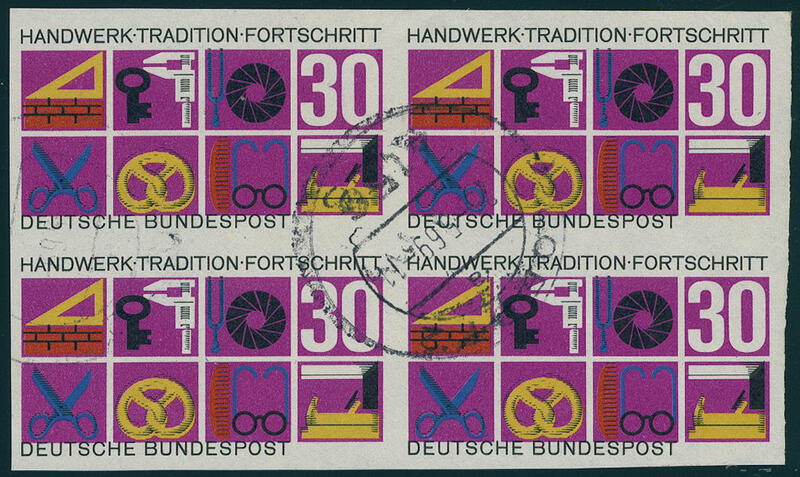 As well the upper stamp above unperforated and lateral partially perforated, fresh colors and in perfect condition mint never hinged an extraordinarily scarce variety, the only in few copies have become known is. Photo expertize \"the condition is perfect\" Schlegel BPP. 7006 ⊙ 553U 30 Pfg. 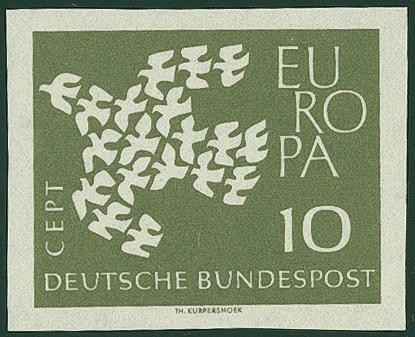 Craft 1968 unperforated in the used block of four, fresh colors and large margins all around. Already single is these variety used extraordinarily rare. As block of four a rarity of this area and possibly unique! Photo expertize \"the quality is perfect\" Hans-Dieter Schlegel BPP. 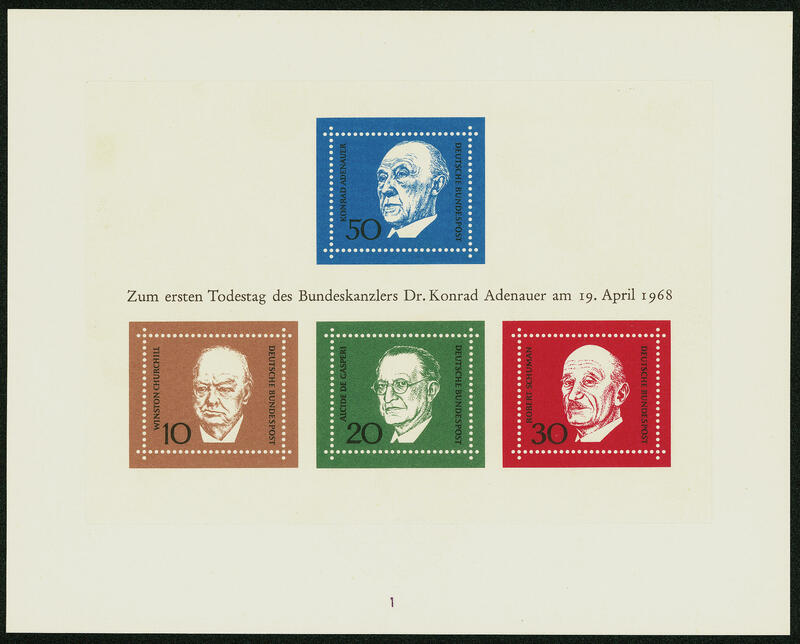 7007 ⊙ Bl.4Pa Adenauer-block 1968 with spectacular variety \"glued paper web\", fresh colors and in perfect condition with two perfect first day special cancellations \"BONN 19.4.68. \". This is a the all large varieties rarities of the Federal Republic. Us is no further copy from this known. A Honor for the large varieties collection! Photo expertize Schlegel BPP. 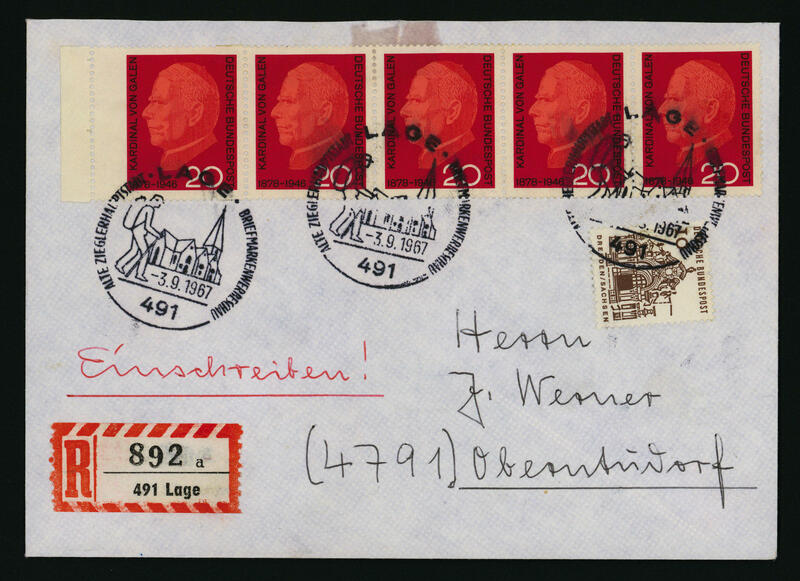 7008 VK Bl.4Probe Adenauer-block 1968, proof in clearly lighter colours on specimen cardboard the Federal Printing Office with stamp seal \"Federal Printing Office\" and on the back dated postmark \"30. January 1968. \". One of the most important Federal Republic rarities and in this kind possibly unique! Photo expertize \"the condition is perfect\" Schlegel BPP. 7009 ⊙ 571F 10 Pfg. 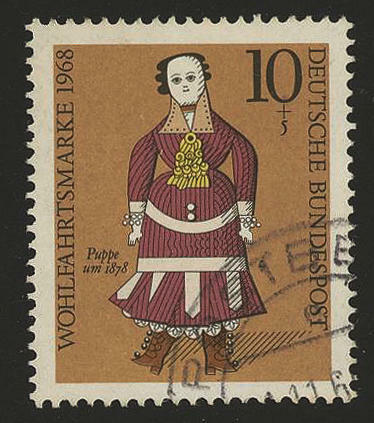 Welfare 1968 with extremely rare variety \"colour MAGENTA (BÄCKCHEN, ribbons in the dress) missing\", fresh colors and very well perforated, neat cancelled \"TROSTBERG\". This is a the rarest varieties of the Federal Republic, the only in very few copies have become known is. Due to missing offers also in the Michel special catalogue only noted without price! Photo expertize \"the quality is perfect\" Hans-Dieter Schlegel BPP.